We laugh at and struggle with this question every year. After all, SwitchPoint deals with huge and serious topics—global health, disaster relief, environment, equity, technology, economics, epidemics, virtual reality, humanitarian innovation, social entrepreneurship, and artivism, just to name a few. But it is also about the joy of collaboration, and great ideas pouring out of creative minds to help promote greater global good. See the full program here. It’s inspiring and yes, it’s a celebration—a celebration intended to nurture solutions and teams, partnerships and projects with real impact. 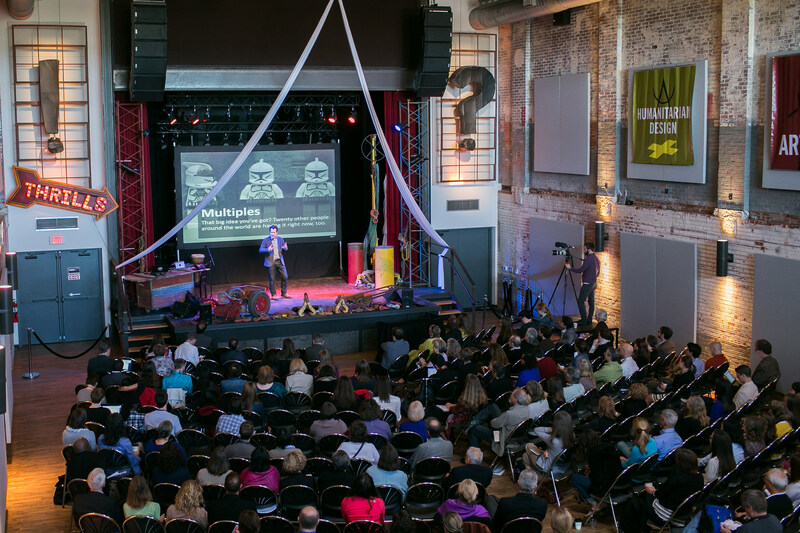 Get your tickets for SwitchPoint, April 21–22, today. This year’s SwitchPoint speakers are coming from the UN Foundation, the World Bank, USAID, major corporations, and from tiny startups in far-off places. They’re coming from those infamous inventor garages all over the world, from schools and labs, governments, magazines, consortiums, and stages big and small. Their talks from the main stage will be intense and inspiring, and participants will have a chance to get to know them offstage, as well sometimes in very unusual conditions and locations. We find this helps make introductions geared toward lasting collaborations. Networking just isn't a big enough word. I think alchemy is a little closer to what we are reaching for. Over the course of the last four conferences (this will be year five), SwitchPoint has featured over 250 speakers and artists. This year there are 66 presenters, 30 main stage talks, 8 performances, 21 microlabs, and 3 field trips. SwitchPoint is produced each year by IntraHealth International, a global health organization that understands the power of creative partnerships and the fast-growing interconnectivity of global development. The focus is broad because it has to be broad in this age of overlapping need, funding, ideas, tools, and goals. This year there are 66 presenters, 30 main stage talks, 8 performances, 21 microlabs, and 3 field trips. SwitchPoint is a gathering in retreat, away from it all, and out—way out—of the box. There are no sterile, windowless hotel conference rooms. Instead we gather hundreds of attendees in an award-winning, three-story music venue ballroom in a renovated mill alongside the Haw River in North Carolina’s historic Saxapahaw, a village undergoing a nationally recognized rural renewal. Participants, performers, and presenters come to this tiny village each year from all over the world. Sometimes this is their one and only American experience. And yes, we choose to do it differently. Art, for example, is a big part of SwitchPoint. It helps get participants focusing with every sensibility. Party Illegal will be DJing from the main stage with a handmade blend of songs curated in partnership with SwitchPoint organizers to highlight the individual background and goals of each speaker. Paperhand Puppet Intervention, Culture Mill, the Art of Cool, and a host of dancers, musicians, photographers, designers, and sculptors are joining in to help illustrate big, complex ideas in new and entertaining ways. There are multiple audience interactive sections of SwitchPoint—and I can’t tell you about those because they are a big part of the fun and a total surprise every year. Food is a stellar aspect of the gathering, featuring Saxapahaw’s farmer/chef foodie network. This year it’ll be brought to you by the Eddy Pub, with special selections to highlight the kind of unique collaborations and unusual combinations SwitchPoint is all about. Microlabs are another experience that set SwitchPoint apart and give participants a chance to tailor-make their own experiences. Choose three microlabs sessions from a menu of seven creative and diverse selections in each round. Each microlab is limited to 30 participants to allow for maximum engagement. And they take place all over the village of Saxapahaw—on the river, in Paperhand’s art studio, in a gigged-out maker shipping container brought in by Betabox, in an outdoor amphitheater, in converted riverside lofts, and on a biodiesel bus. And that’s just a handful of what is going on with microlabs. See the full list here. SwitchPoint 2016 speakers are doing incredible things, often with very limited resources. Finally, we have some fantastic field trips lined up. These give participants a chance to further explore the village and have time together to process and network at the close of the event. Get out on the river in kayaks, meet the baby animals at Cane Creek Farm, or go behind the scenes at Haw River Farmhouse Ales. And yes, we have networking parties in the evenings as well. Be prepared to absorb a lot. It can be overwhelming in scope and in how much it moves you. SwitchPoint 2016 speakers are doing incredible things, often with very limited resources. Their drive and ingenuity might blow you away and, we hope, encourage you to make your big idea a reality—no matter what. Confestival? Festerance? No, it is what it is: SwitchPoint, in a category all its own.